No! This is not a spacecraft, it is also not a hot ballon set to float. This is the photo of Ariake Sports Center in Tokyo, Japan. 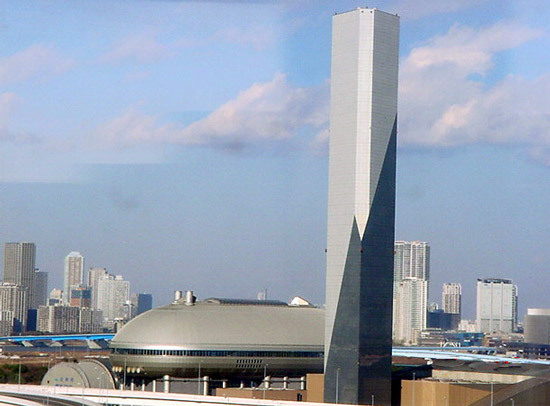 Here are some of the most impressive landmarks in Tokyo: The Ariake Sports Center and the towering smokestack. This unmistakable twin was captured with my lens from about 150 meters above the ground on another landmark, the ferris wheel at Odaiba. Ariake Sports Center is built on reclaimed land in the Ariake waterfront of Tokyo. Designed like a spaceship, from the ground it stands like a gaint ballon ready to float. The Ariake Sports Center was completed in 1996. Facilities at the sports center include swimming pool, sauna, gym, volleyball and basketball courts, a restaurant, etc. Access: Yurikamome Line, Odaiba-kaihinkoen station, about 8-minutes walk. Standing next to the Ariake sports center is a giant smokestack or incinerator from which the swimming pool of the Ariake sports center is heated.